Maya Angelou was born Marguerite Annie Johnson, in St Louis, Missouri, in 1928. Best known for her 1969 memoir “I Know Why the Caged Bird Sings”, she wrote seven autobiographies, and was a playwright, director, actor, singer, songwriter and novelist. However, the most important thing that Maya Angelou will be remember for is how she overcame the challenges of her youth and inspired millions of people worldwide with her life, her writings and her words. “She lived a life as a teacher, activist, artist and human being. She was a warrior for equality, tolerance and peace,” said her son, Guy Johnson. 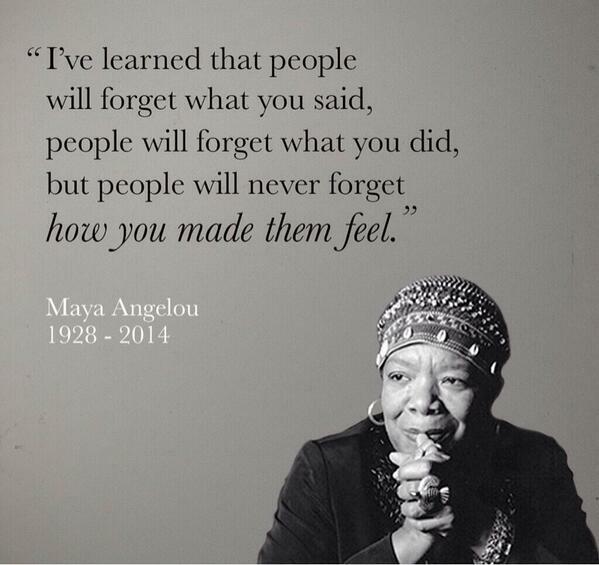 She leaves with us a goldmine of quotes that will continue to inspire and guide us. These are words that she will be remembered by and we should all strive to allow this kind of love to guide us in our lives. This entry was posted in Inspirational, Mother, Wife, Women and tagged activist, artist, author, Guy Johnson., inspiration, Marguerite Annie Johnson, Maya Angelou, Mentor, poet, remembering Maya Angelou, teacher, tribute, Woman. Bookmark the permalink.